Remember there is always something we can use your help with. Chrysalis encourages that families put in 40 hours of volunteer time per year. So start early. Check out the opportunities below or contact Ms. Crystal for ideas of how you can get involved here at Chrysalis! We love our parent volunteers! Don't forget to join our Parent Club today! Check out their Facebook (look up Chrysalis Parent Club) for information on how to get involved. Meetings are once a month and count toward your parent volunteer hours. Sign Up Genius is pure genius!! I am excited to be using the Sign Up Genius website based sign up system again this year. I will post sign ups for class parties, field trips, and volunteer jobs all through Sign Up Genius. Emails will be sent to you notifying you of new sign ups when I post them. If you have trouble logging on please let me know and I will help you. Some sign ups that we have available now are listed below. Please check them out. If there is a family relative that would be interested in having access to these Sign Ups, please let me know and I can add their email address to our Sign Ups so that they can also receive access. Classroom Volunteer Jobs - SIGN UPS AVAILABLE NOW! Help fill our classroom Treasure Chest! Chrysalis offers one hour of parent volunteer time for every $10 spent in donations to our classroom. Save your reciept from the purchase and turn them in to our school office with your family name written at the top to get credit towards your volunteer commitment. 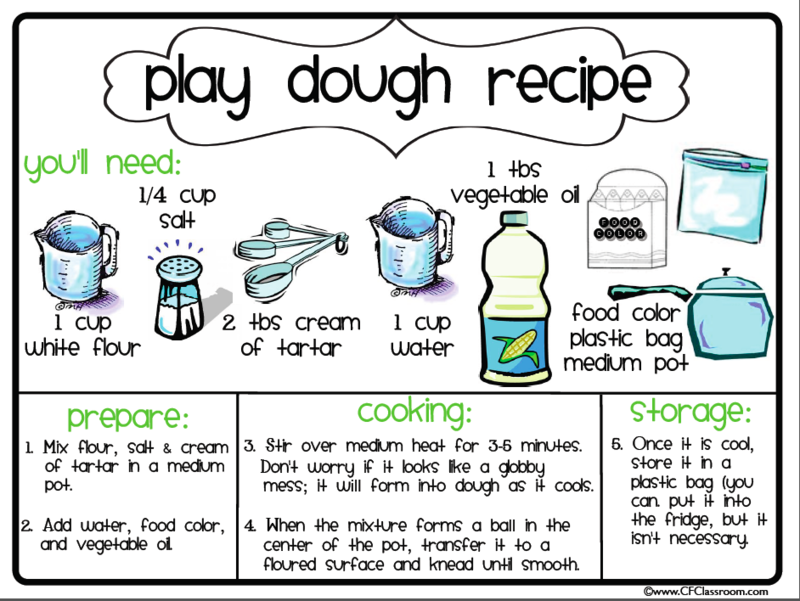 Can you make a batch of play dough for us? What? Play Dough in 3rd grade? Yep (and even older kids love it too)! Unlike a paper and pencil task, which may create anxiety in some students when entering a new classroom or topic of study, ALL children can use clay without feeling nervous. I like to keep a fresh batch of clay in the classroom throughout the year. The students enjoy using it for indoor recess and it makes great stations during math workshop (measurements, creating 3D solids, solving word problems, fractions). I also use it at times of free choice play such as rainy day recess days. It is an easy recipe you can make with your child and send in to school. It’s a great volunteer opportunity for busy parents that still want to help the classroom in some way. You can use any recipe, but a tried and true recipe is below. Any color is welcome! Each time you turn in the play dough to the classroom counts as 2 hours of volunteer time. One batch per month. Note: A cheap tupperware container works better to store the play dough in than a plastic bag if you have one to donate. WANTED! Donations of used iPhones or iPods (touch screen only please) that are still in working condition. We will be using these to replace our CD players when practicing reading fluency in the classroom. Donations will count toward volunteer hours. Please submit to Ms. Crystal with a donation note with your family name on it. Thank YOU!! !